From helpful in-branch service to in-the-moment mobile and online banking, Merchants has the personal services that make banking a seamless part of your day. Our debit cards, online, mobile and telephone banking enable you to stay in touch with your money. Our friendly staff and convenient hours helps you stay in touch with us. Whatever personal banking services you use, the thing that makes them personal is still the real person that answers when you call. 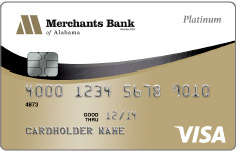 Merchants Bank of Alabama offers instant issue EMV Chip Debit Cards for your convenience. Stop by your local branch and get your debit card that you can use right away. You’ll have immediate access to the money in your account. The chip technology provides stronger protection by making it difficult for your card to be copied or counterfeited at chip-enabled terminals as a unique code is created for each transaction. In addition to using your card at chip-enabled terminals, your card has a magnetic stripe allowing you to use it, at retailers who do not yet have chip-enabled terminals. The EMV Chip Debit Card technology provides an enhanced level of security and greater worldwide acceptance as it is already standard practice in more than 130 countries worldwide and more U.S. merchants are accepting chip cards every day. As more merchants become chip-enabled, you will notice a slightly different experience when you use your card. Insert and leave the chip end of your card into the terminal with the chip facing up. Keep your card in the terminal and follow the prompts on screen. And finally, remove your card when prompted and take your receipt. You may have to sign for your purchase. For online or phone purchases, simply provide your card number and complete your transaction as you do today. For lost or stolen debit cards, call 1-800-500-1044. You chose to bank with us for a lot of reasons and we’re giving you one more. Now you can apply online for a Visa® Platinum credit card. Cash Back: Earn a full 1% cash back on everything you buy. There are no spending tiers or minimums. Cash back is earned on all your purchases up to the first $60,000 for consumer ($35 annual fee) in annual spending. Use our online banking services to view, print or save your most recent account statements. Going online is a great way to go green. Merchants Bank offers a new, more convenient way to make payments or transfer money from one bank to another: ACH Origination. You can now make loan payments here at Merchants Bank from a checking account you may have at another bank. Or you can transfer money from another bank account to your account at Merchants Bank. ACH Origination gives you the peace-of-mind of knowing that while you are out of town your bills will be paid or transfers will still be made. All you need is a telephone with touch-tone capabilities to stay in touch with your accounts. The Merchants Bank 24-hour Telephone Banking lets you check deposits and loan account balances 24 hours a day, 7 days a week from any telephone with touch-tone capabilities. You can confirm if checks have cleared and deposits have been made, transfer funds, and check your loan or CD balance. Stop by your local branch for Traveler’s Checks, Cashier’s Checks, Wire Transfers, Stop Payments and Notary Services. We have safe deposit boxes available at all of our branches. Additional services include Bank-By-Mail, Night Depository, Lock box Services and Check Collection Services. Please inquire today to learn more. If you have any questions or need more information about any of our personal services, please feel free to contact us at 256-734-8110 or 1-800-840-4458 and start using the services that make banking easy.